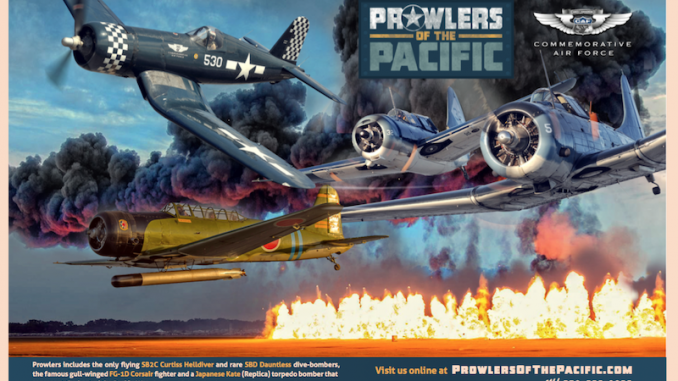 The massive roar of the radial engines, the smoke trailing from an aerial dog fight and rare warbirds fighting will re-create the scene over the waters of the Pacific! 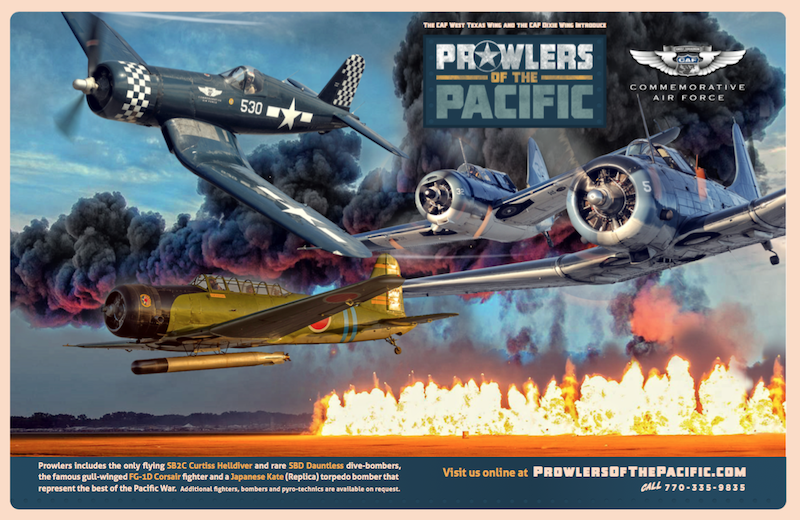 The story of the Prowlers of the Pacific begins on that fateful day in December, 1941. The war in the Pacific doesn’t take place over land and airfields are rare. The war takes place over millions of miles of ocean and the aircraft carriers become the chess pieces each side maneuvers. Each carrier was equipped with fighters, bombers and torpedo planes to do battle and we put you at the head of the task force with the Prowlers of the Pacific! The world’s only flying SB2C. The final purpose-built dive-bomber to enter the Navy inventory, the Helldiver was a troubled beast, and often bore the brunt of derisive jokes from its crews. When called upon, however, the aircraft and its committed crews were certainly capable of making an impact on history. During the battle of the Philippine Sea, the U.S. counterattack had 51 Helldivers at its core. The crews took off late in the day in search of the Japanese fleet, knowing that carrier operations after dark were exceptionally dangerous – by the time they had struck the Japanese, the sun had set – and to compound their issues, many of the airplanes had run out of fuel, and had begun to ditch on the return flights. Aware of the peril faced by their airmen, the picket ships in the task force began to illuminate every light they had aboard, hoping to guide the airmen home to their carriers. Operations to rescue those who had ditched at sea began immediately – almost three quarters of which were successfully rescued. 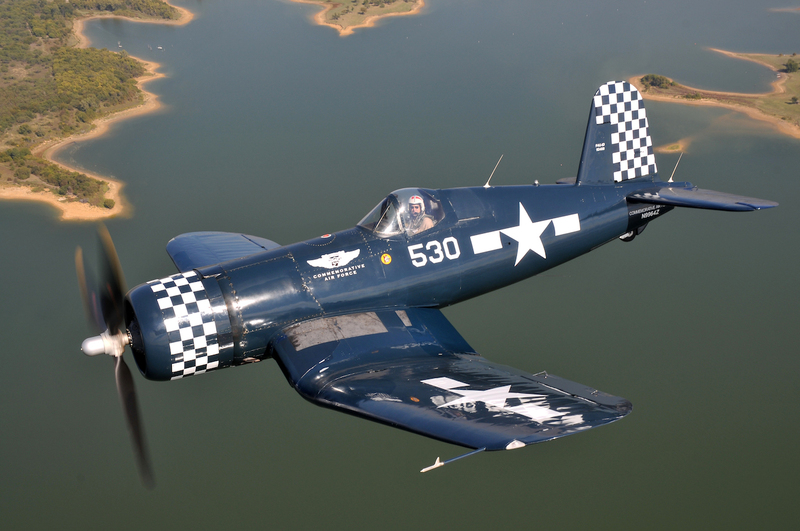 The Corsair, originally developed by Chance-Vought, and produced by Goodyear and Brewster under license, has become one of the most popular Fighter aircraft of the Second World War, however, its original debut as a Carrier-borne fighter was less than spectacular. The airplane had been intended to replace older naval fighter variants, but its difficult carrier landing characteristics caused the navy to pass many of the airplanes off to the Marine Corps’ land based air support units. 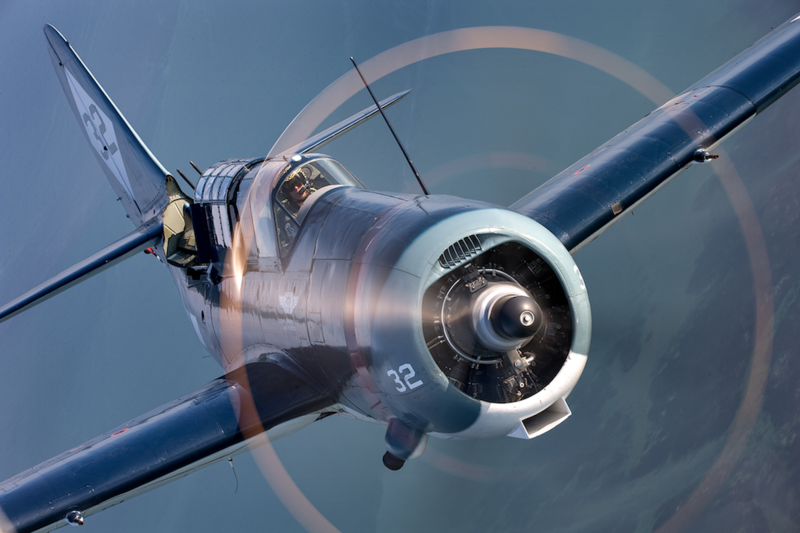 The Marines gladly accepted the Corsair and groups like the “Black Sheep” squadron and the “Jolly Rodgers” tore up the skies. The carrier landing quirks were eventually worked out, allowing the Corsairs to return to the Fleet’s aircraft carriers – just in time to participate in some of the most grueling engagements in the war. The Palaus, Iwo Jima and Okinawa. It was here that the airplane earned a reputation as a “Mudfighter.” Getting down and dirty to support troops on the ground. Its impressive performance characteristics also earned it a reputation as a Kamikaze hunter in those dark days. The Nakajima B5N (Japanese: 中島 B5N, Allied reporting name “Kate”) was the standard carrier torpedo bomber of the Imperial Japanese Navy (IJN) for much of World War II. The aircraft flying in the airshow is actually a replica, built in 1969 for the Movie Tora! Tora! Tora! by combining the airframe of a North American SNJ-4 with the tail section of a Vultee BT-13. With its 600 hp Pratt and Whitney R1340-AN engine, its performance is actually equivalent to that of an original Kate. In addition to its role in Tora! Tora! Tora!, this Kate has appeared in the movies The Battle of Midway, The Flying Misfits, War and Remembrance, and the TV Series, Black Sheep Squadron. The Northrop Corporation first developed the SBD before World War II. It was first flown in July 1935, but considered obsolete by December 1941 when the Japanese attacked Pearl Harbor. 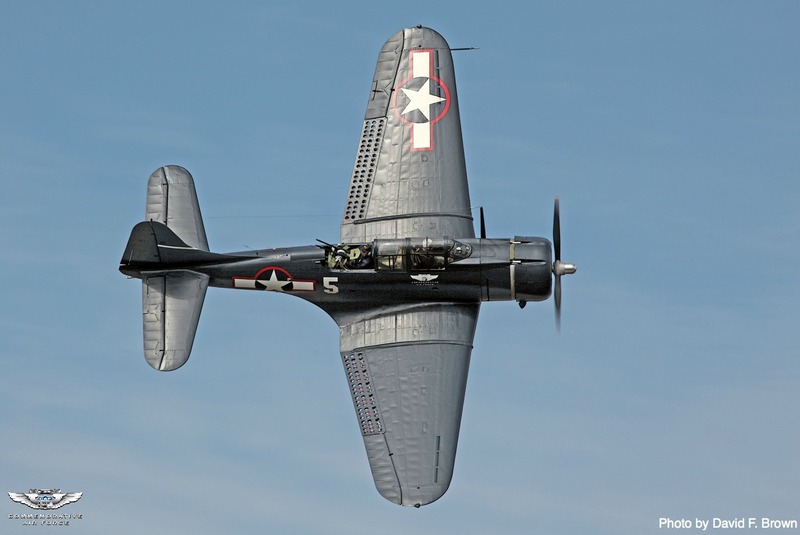 Douglas Aircraft purchased the SBD contract and the SBD-1 was first delivered in late 1940. Over 5,000 aircraft were built and production of the carrier-based scout, dive and torpedo bomber ceased in July 1944. 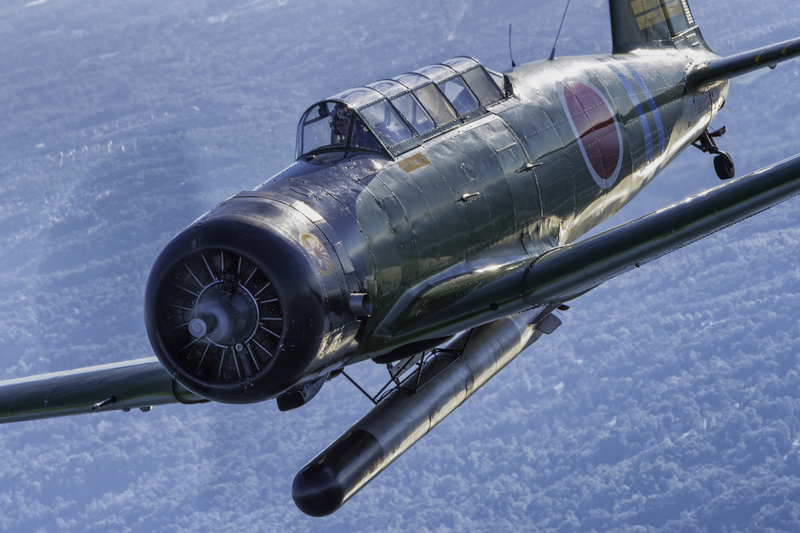 Despite accusations that the aircraft was under-powered, vulnerable, lacking in range and exhausting to fly for any length of time, the “Dauntless” helped turn the tide of World War II at the Battle of Midway on June 4, 1942. The “Dauntless” sunk four major aircraft carriers of the Japanese Navy, ceasing Japanese expansion in the Pacific. The SBD also served with 20 U.S. Marine Corps Squadrons and many SBDs were retrofitted with Westinghouse ASB radar, the first to be used by the U.S. Navy.Though considered obsolete on that “Day of Infamy” in the skies over Pearl Harbor, December 7, 1941, the SBD was the first American combat aircraft to shoot down a Japanese Zero fighter. It may have been slow, but it was deadly, as that Japanese pilot found out that day. The SBD was the only U.S. combat aircraft to fight from the beginning of the World War II until the end. Considered the most destructive air weapon of the U.S. Navy, the SBD sank over 300,000 tons of enemy ships, a greater tonnage of Japanese shipping than any other Allied aircraft during the war! Eighteen were warships, including five aircraft carriers sunk in the battle of the Coral Sea and Midway. It earned the nickname “Slow, But Deadly!” After the war, the U.S. Marine Corps continued to use the SBD, and in the 1950s, the French Air Force used SBDs in its war in Indo-China. The Dixie Wing, based in Peachtree City, Ga., was approved as the 83rd CAF unit on Feb.28, 1987, and has since displayed its collection of vintage World War II aircraft in numerous air shows throughout the United States. The wing is a non-profit, tax-exempt “flying museum” that relies on contributions of time and funds to carry out its mission. For more information about the CAF Dixie Wing visit www.dixiewing.org.